Is your company following OSHA fall protection standards? Each year, falls consistently account for the greatest number of fatalities in the construction. The Occupational Safety and Health Administration (OSHA) has determined that the four most significant causes of death and injuries in the construction industry are caused by falls, electrocutions, caught-by, and struck-by incidents. The first two are self-explanatory. Being crushed by the moving outrigger on a man lift is an example of a caught-by accident. Being hit by an excavator’s bucket as it slews or an unstable stack of lumber is a struck-by accident. According to the Bureau of Labor Statistics, in 2012, the majority of contractors (54 percent) were working in construction and extraction occupations when fatally injured. The deceased in this occupational group were most often employed as construction laborers (101), first-line supervisors of construction trades and extraction workers (42), electricians (39), and roofers (32). For more information on fatal injuries incurred by contract workers, see the 2012 charts. Those who are not already on board with safety practices should ask themselves why? Based on injury records on falls from attics or between ceiling joists, OSHA has established enhanced residential fall protection standards. If truss chords or ceiling joists have insufficient structural integrity to bear the load of one or more 150- to 200-pound workers, plus their tools and materials, the truss of joist system may collapse dropping workers 8 feet or more and possibly landing on others working in the space below. The system must be inspected before work begins. A temporary wall might be installed or employees should work between the ceiling joists from a scaffold. Plywood decking on the joists or truss chords may also make the structure safer. Fall protection involves equipment and techniques designed to prevent falls and or reduce injury if a fall takes place. Let’s first talk about equipment. Equipment must be chosen, installed, used and maintained properly for the conditions in effect, and be assembled properly under the supervision of a competent and qualified person. A manlift must be stabilized when elevated and workers must be careful of ejection from a bucket when motorized lifts moves over uneven ground. Railings and anchorages must be in good condition and must be properly rated for the relevant loads and hazards. Ladders must be properly rated, footed on a stable surface, in good condition and the top at 3 feet above the parapet for safe access to a higher level. Scaffold components and all hardware must be properly integrated and in good working order and outriggers used if necessary. Planks must be in in good condition, without improper holes. Guardrails need to be stable, mounted to solid anchorages, 42 inches high, with proper midrails, and able to withstand a 200-pound force. Fall restraint systems pay out line to allow a person to work safely at the ledge, but stop upon a sudden load to prevent or stop a fall. It is somewhat like the line and leash on a dog run. A warning line system is comprised of ropes, wires or chains that serve as a strong reminder to stay (depending on the work) not less than 6 or 10 feet from a ledge. What fall protection is required? 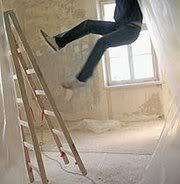 OSHA requires the proper use of safe, properly rated and installed ladders, scaffolds and a personal fall arrest system (PFAS) for workers in attics and all work at 6 feet or greater above interior or exterior surfaces. These hazardous locations are not limited to attics and roofs, but include the high exterior decks or patios and the walls or ceiling in a great room. In its recent residential fall protection advisory, OSHA recommended the use of a pre-installed anchorage system, a cable in the attic to which the worker would clip his/her safety lanyard when entering the attic or other elevated work space. While we are not required to use fall protection equipment while performing initial inspections and evaluations of conditions in a remodeling project, we must obviously still exercise extreme caution and good judgment before entering precarious, confined or otherwise potentially unsafe conditions. An anchorage to which the other components of the PFAS are rigged. A full body harness worn by the worker. A connector, such as a lanyard or lifeline, linking the harness to the anchorage. A rip-stitch lanyard, or deceleration device, is an essential part of the system. Once these systems and procedures are in place, the employer’s safety culture and worker training must come into play. Each worker needs to know how to properly use the equipment and be expected to report an unsafe condition, damaged equipment shall be taken out of service and repaired if possible—or discarded—and safe practices take priority over expediency. When was the last time you used a 2 x 10 as a scaffolding plank? What is the proper loading on that pick board? Does the scaffold need outriggers? Is that lanyard connected at a secure anchorage? Does the system require toe boards? What is a toe board? What safety rules apply on a multiple-contractor site? Who is your OSHA-approved competent person and what are that person’s duties? How do I create and implement a safety plan? If you do not know the answers to these questions, you have a duty to take an OSHA 30 for Construction class and get your team into an OSHA 10- or 30-Hour class. Otherwise, you, your team, your business and your client are at risk. The same is true for your subcontractors. Browse www.osha.gov and either enter “fall protection” or other search parameters in the “Search” window or click on “A to Z Index”. Ten- and 30- hour training is available from a number of OSHA authorized outreach training centers and online. Online training may be less expensive and more convenient, but not all people learn as well in self-directed as they do in classroom training. In addition, your instructor may be able to customize your experience with electives and options to better match the risks in your work. Wayne Baruch, MBA, is owner of The Artisans Group and expert witness/consulting practice in Hillsborough N.J. and is an OSHA-authorized outreach trainer.